Quite nice. Some blocky attribute parts (but it's funny to see a triangle rasterizer in such low res :) and a finaly part with the high res tunnel renderer which I liked quite. Yep a good collection/variety of effects. ok demo. recycled graphics but some nice fx such as glitched sinewaves and the tunnel at the end. 53-colours pictures - i'am waiting for this FX for ages - tnx! Very Galactikans Demos!!! Music Yerza Supper!!! GFX Best -Agenda Molodca! Codes Supper Pupper ! Fantastic. I especially enjoyed the music and the tunnel. The triangle rasterizer could use a bit more work considering the corners showing through. Awezome kode, graphix, musix and ideaz! ;) Well done guyz! What to say? A very high HOOY-PROGRAM standard. By the way, how did you persuade MAT/ESI to join??? I was somehow confused --- did he submit old unused code? Or is his part entirely new? Nevertheless, it would be nice to change your style --- your 4ever demos are, as concerns their form, very similar to each other. Wicked stuff as ever from the Hooy-Massive! That tunnel effect is just the best. Good music too. Wow, great multipart demo, really liked how the intro set it all up. Great fullscreen pics and tunnel effect. Also, loved the music in the 3d part. Who needs attribute clash when he can have lores :-) Start, tune and ending are very nice. Middle and the 53 color pictures are probably something that's cool in ZX but I found the steady pics more appealing. rulez added on the 2012-03-19 23:11:32 by JAC! good one. especially the tunnel part. only watched the YT. The tunnel is pretty slick. To be this smooth it must be only EOR'ing the few pixels that change, like the fullscreen twisting scrollers in the demos by Holocaust on Atari. Second - I was asked by Tygrys if I'd be interested to make some contribution and I agreed. Third - no, it's not an old unused code. It's entirely new and original code recycling old Sam Coupe effect on Spectrum. Nice tunnel at the end, but character res fx are reeeal blocky. Very good music and pacing for the most part. I also found static pictures more appealing than the 53-color ones, but eh. As said, nice tunnel at the end. Good work. Also, are there separate tunes to download to listen? fun to watch and pleasure to hear! The last part is my tribute to Yoomp! An 8-bit Atari Game. 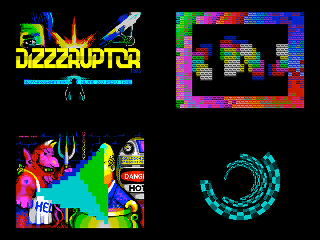 Awesome megademo for 48K Speccy. page created in 0.017409 seconds with 15 queries.